X-Pac turned “babyface” and formed a tag team with his new friend, Kane! 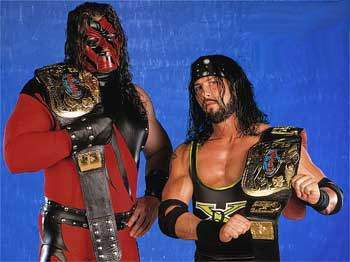 March 30, 1999 – RAW: Kane and X-Pac defeated Jeff Jarrett and Owen Hart for the tag team titles! May 2, 1999 – Sunday Night Heat: Billy Gunn turned on X-Pac..
Over the Edge 1999: Kane and X-Pac defeated D-Lo Brown and Mark Henry.. Fully Loaded 1999: X-Pac and Road Dogg defeated Billy Gunn and Chyna for the rights to the DX name..
X-Pac began taking it upon himself to try to proove that he could handle himself in the ring with Giants..
No Mercy 1999: X-Pac defeated Kane and Faarooq and Bradshaw in a Four Corners match..
October 28, 1999 – Smackdown! 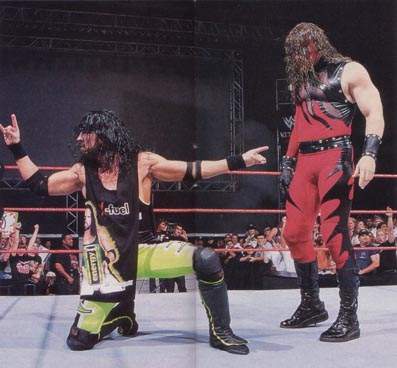 : The Dudley Boyz defeated X-Pac and Kane when X-Pac turned on Kane! 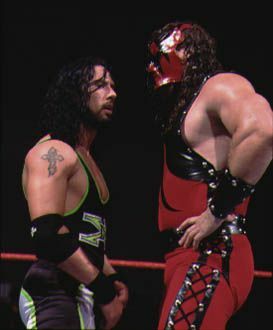 XPac & Tori turned heel screwing Kane in the process..
No Way Out 2000: X-Pac defeated Kane..
Wrestlemania 2000: Kane and Rikishi defeated Road Dog and X-Pac..